Occasionally I run across obscure American road races that occurred before WW-I. This category is designed to capture and preserve such races. The attached articles concern an auto race that occurred on Long Island little more than a month prior to the 1909 Vanderbilt Cup Race, the more established classic that took place in the same general vicinity. This is a brief article from the December 20, 1908 Indianapolis Star. It substantiates a view I have developed after sifting through a wealth of automobile and auto racing news coverage from 1908 - and that is that auto racing hit a turning point during the 1908. It was an important step forward in maturation that led to a proliferation of big-time events, at this point mostly road racing, across the United States. This very brief item was published in the September 19, 1909 Indianapolis Star. 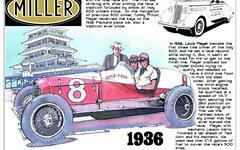 It concerns the entry of two Indianapolis-built Marmon automobiles being in a pair of endurance runs. One, from Washinton D.C. to Boston was called the Munsey Tour. The article in attachment Record102409 was originally published in the Indianapolis Star on October 24, 1909. It concerns the running of road races that were part of a celebration called the "Portola Festival" in Oakland, California on October 23. The article in attachment RoadRaces121209 was published in the December 12, 1909 Indianapolis Star. This article is a re-print from the trade journal, Motor Age, and provides an analysis of the performance of cars and drivers of the 1909 auto racing seaon in road races. This is an important point as the data does not reflect accomplishments in oval track or beach races.